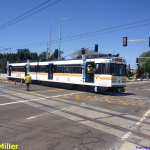 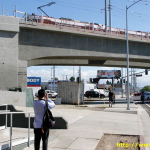 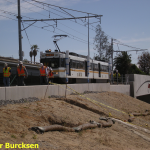 Home Urban Development The 9 Best Pics of Expo Line Trains Traversing West L.A. 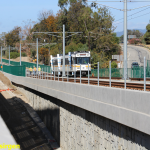 The 9 Best Pics of Expo Line Trains Traversing West L.A. 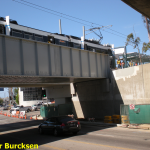 The under-construction Expo Line extension to Santa Monica is now in the exciting testing phase. 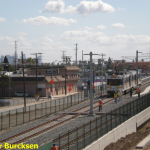 Monday marked the first day that transit trains traveled west of Culver City, as officials made sure the light rail cars could actually move down the tracks and pull into the stations. 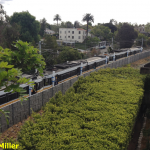 There weren’t any surprises, thankfully. 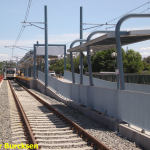 Even though testing has begun don’t expect an opening for another year, thanks to a shortage of trains and finishing touches for the seven stations and 6.6 miles of track. 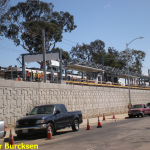 Even though we’ll have to wait a little bit longer before we can ditch the 10 and ride trains between Santa Monica and DTLA, the train is finally pulling into the station.